IIW is NOT an advocacy group – sigh "the media"
Facebook’s Online Identity War quotes me and labels IIW an advocacy group. IT IS AN INDUSTRY FORUM. Douglas MacMillan. Sorry but I am still learning “how” to talk to reporters. They don’t like to quote me as “the identity woman” and link to my blog. Identity Commons & IIW have a purpose and principles believing in user/centric identity. The power of individuals to manage and control their own identities online. We don’t “advocate” for them – we create a convening space for people who want to work on this ideal. Facebook does on some level “agree” with the idea of user-centric identity – Luke Shepard has participated in the community for quite a while & they hired David Recordon. They sponsor IIW. I am clear that the opening up of previously controlled information with no warning “jives” with my understanding of user-centric control. It was more from my own point of view I was commenting. That is with my “identity woman” hat on… and the values I carry from Planetwork and the ASN… but the press hates that. Uggg. Chris Messina gets to be an “open web advocate”… that is what I do to but just about identity “open Identity advocate” (mmm…) but then that sounds like “just” OpenID and it isn’t just about that one particular protocol. sigh. I am still wondering – How does one “belong” and have “titles” in a way the media can GROK when one does not have a formal position in a formal organization. What are identifiers in the digital context? Jean Russell and I continued our conversation on What are Identifiers this time focusing on the digital context. We cover what user-names are, how they are not portable, what it means to have a portable identifier – and talk about the open standard that enables portability – OpenID. It is up on the Reputation Currents Blog. This is cross posted on Fast Company. The Obama administration open government memorandum called for transparency participation, collaboration and federal agencies have begun to embrace Web 2.0 technologies like blogs, surveys, social networks, and video casts. Today there are over 500 government Web sites and about 1/3 of them require a user name and password. Users need to be able to register and save information and preferences on government Web sites the same way they do today with their favorite consumer sites, but without revealing any personally identifiable information to the government. Yesterday the United States Government in collaboration with industry announced a few pilot projects using emerging open identity technologies for citizens to use when interacting with government sites. I use the word interacting very deliberately because the government doesn’t want to know “who you are” and has gone great lengths to develop their implementations to prevent citizens from revealing personally identifiable information (name, date of birth etc). How would you use this?–well imagine you are doing an in depth search on an NIH (National Institute of Health) Web site–and you went back to the site many times over several months. Wouldn’t it be great if the site could “know” it was you and help you resume your search where you left off the last time. Not your name and where you live but just that you were there before. The Identity Spectrum helps us to understand how it all fits together. The government pilot is focused on supporting citizens being able to have pseudonymous identities that function only at one Web site–the same citizen interacting with several different government Web sites needs to use a different identifier at each one so their activities across different government agencies do not have a correlation. It is likely that some readers of this blog know about and understand typical OpenID. Almost all readers of this blog do have an openID whether they know it or not because almost all the major Web platforms/portals provide them to account holders–MySpace, Google, Yahoo!, AOL etc. So how does this work with OpenID? Typically when logging in with OpenID on the consumer Web you share your URL with the site you are logging into–they redirect you to where that is hosted on the Web–you authenticate (tell them your password for that account) and they re-direct you back to the site you were logging in. (see this slide show for a detailed flow of how this works). Using OpenID this way explicitly links your activities across multiple sites. For example when you use it to comment on a blog– it is known your words come from you and are connected to your own blog. Using the OpenID with Directed identity–de-links your the identifiers used across different sites but still lets you use the same account to login to multiple sites. 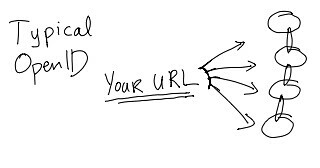 When you go to login to a site you are asked to share not “your URL” but just the name of the site where your account is–Yahoo! or Google or MySpace etc. you are re-directed to that site and from within your account a “directed identity” is created–that is a unique ID just for that Web site. Thus you get the convenience of not having to manage multiple accounts with multiple passwords and you get to store preferences that might be shared across multiple ID’s but you don’t have identifiers that correlate–that are linked across the Web. How does this work with Information Cards? 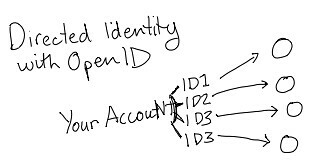 This is a complementary open standard to OpenID that has some sophisticated features that allow it to support verified identities along with pseudonymous & self asserted identities. 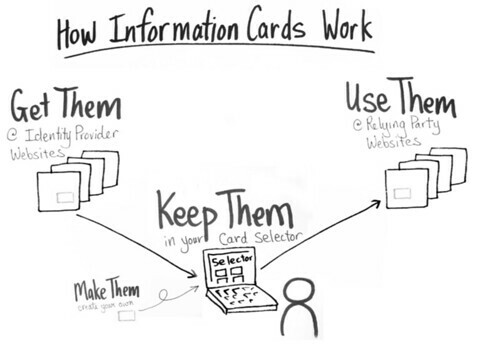 It involves a client-side piece of software called a selector–which selector helps you manage your different identifiers using a card based metaphor, with each digital “card” representing a different one. Citizens can create their own cards OR get them from third parties that validate things about them. The government is creating a privacy protecting “card profile” to be used in the pilot program. It is NOT issuing identities. Trust Framework are needed to get it all to work together. [They] are working with the U.S. General Services Administration to create open trust frameworks for their respective communities. These frameworks, based on the model developed by the InCommon federation for higher education institutions, will enable government Web sites to accept identity credentials from academic, non-profit, and commercial identity providers that meet government standards. These standards are critical as they represent the government’s resolution of the challenging and often competing issues of identity, security, and privacy assurance. Open trust frameworks not only pave the way for greater citizen involvement in government, but can enable even stronger security and privacy protections than those typically available offline. These are all exciting developments but there is much more to do. Looking (far) ahead there may be the opportunity to do selective disclosure–combining anonymity with verified identity. How do these go together–you can take a verified identity claim say your birth date then using cryptography strip the specifics away and just have a claim that says you are “over 21”. Then using an anonymous identifier you have selectively disclosed your age without giving away your date of birth. You could imagine this would be handy for citizens wanting to communicate their opinions to their member of congress without revealing their actual name and address – they could “prove” using a verified claim they live in the district but not reveal who they are. This aspect of what is possible with the technology is VERY forward looking and will take many years to get there. There is enormous potential to evolve the Web with this emerging identity layer. I would like to invite all of you interested in being involved/learning more to attend the Internet Identity Workshop in Mountain View California November 3-5. I have been facilitating this event since its inception in 2005. It is truly amazing to see how far things have progressed from when we were 75 idealistic technologist talking about big ideas. at the Hillside Club in Berkeley. It is also some what daunting to think about how much farther we have to go. This evening I was fortunate enough to be invited to attend the joint OpenID and Information Card Foundation dinner. It was fun to connect with everyone and it really meant a lot to me to be there. It has been a long journey as a community since the first Internet Identity Workshop in Oct 2005.